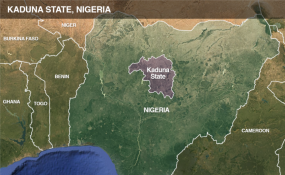 The United Nations International Children's Emergency Fund (UNICEF) says that 6,000 newborns in Kaduna State are at risk of contracting HIV in 2019 if elimination of Mother-To-Child Transmission (eMTCT) of HIV interventions are not implemented. NAN reports that the meeting was organised for the wives of local government chairmen in the state to give feedback on the level of implementation of 2018 demand creation activities on eMTCT of HIV. Mr Adam said that Kaduna State was one of the four states in the country being supported by UNICEF to pilot eMTCT by 2020 and end adolescent AIDs epidemic by 2030. He said that though the state had recorded an increase in eMTCT coverage from 16 per cent in 2012 to 66 per cent in 2017, it was still challenged by low Antenatal Care (ANC) attendance and hospital delivery. He also said the state was equally battling with low awareness about the benefits of eMTCT and inadequate human resources for quality health services. "Currently, there are 6,000 babies at a risk of getting HIV infection in 2019 if appropriate and innovative eMTCT interventions are not fully implemented. "This meeting, therefore, provides an opportunity to lay bare all the eMTCT challenges with a view to taking proactive measures to tackle them," he said. A resource person at the meeting, Lawal Abubakar, said that inadequate funding was grossly affecting eMTCT activities in the state, leading to inadequate test kits and other HIV commodities in eMTCT facilities. "There was also weak linkage of pregnant women tested HIV positive from health facilities to HIV treatment. "As at 2017, 56 per cent of antenatal care facilities were provided with eMTCT service and only 66 per cent of HIV pregnant women were placed on treatment," Abubakar added. The Kaduna state Commissioner for Health and Human Services, Paul Dogo, said that the state had achieved a giant stride in reducing the prevalence of HIV in the state. He said that HIV prevalence had reduced from 11.6 per cent in 1999 to 1.1 per cent in 2018, adding that the state had moved from prevention of mother to child transition of HIV to elimination. Mr Dogo said that the state government had taken all necessary measures to ensure the attainment of zero mother to child transmission by 2020. "To achieve this, the state government had in 2012 established 126 eMTCT sites and currently we have 927 eMTCT sites. "All we need is increase demand for such services, which is where the wives of the local government chairmen come in. "We need you to support the wife of the governor to create the needed awareness to our mothers in all LGAs to demand for HIV services which are readily available in health centres," he said. He, however, noted that partners funding was decreasing, saying the need to increase domestic funding for HIV intervention to sustain the progress so far achieved. Marc Anthony, Executive Secretary, Kaduna State Agency for the Control of Aids, expressed optimism that the state would achieve zero new infection of HIV among newborn by 2020. "But to achieve this target, pregnant mothers in the state must be tested and provided with access to quality HIV services at zero cost," he said. The wives of the LGA chairmen reiterated commitment toward ensuring that no woman was left behind in the demanding for eMTCT services in their various LGAs. They said during their presentation of the implementation of the 2018 LGA eMTCT plan that they would continue to mobilise pregnant women to go for ANC and demand for HIV services. The wife of Zaria Local Government Chairman, Amina Bamali, said she had visited 13 out of the 16 Primary Health Care centres (PHC) in the LGA, adding that the turnout of women for ANC was very encouraging. Mrs Bamali, however, disclosed that only a few of the facilities did not have HIV test kits and called on the state government to ensure that all PHCs have adequate test kits so that no woman would be left out. On her part, the wife of Kaduna State Governor, Ummi El-Rufai, appealed to the wives of the LG chairmen to redouble their effort to ensure that no child is infected with HIV. "Take this as a personal responsibility in ensuring that all pregnant women in your respective areas are enlightened on the benefits of eMTCT, attends ANC and demand for HIV services. "This is the only way we will continue to make progress toward achieving zero new infections of HIV among newborn in Kaduna state," she said.